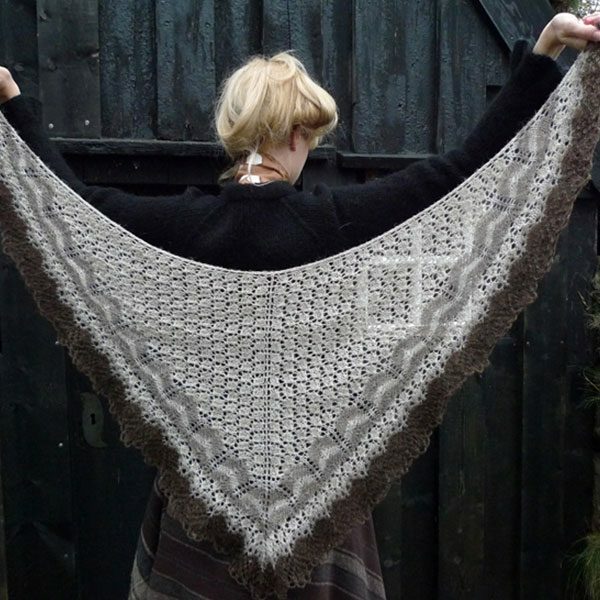 The beautiful Icelandic lace on display in the Nordic Heritage Museum in Seattle inspired Evelyn Clark to design this wonderful lace shawl pattern. 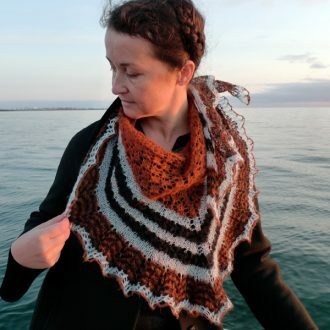 The story back with the design is no less fascinating than the shawl: read about it here on the blog. The shawl has been modernized so both the patterning and size can be customized. It has a narrow garter stitch border and interchangeable repeats of Spider and Trellis lace. It ends with a lacy edging that is bound off with crocheted chains. 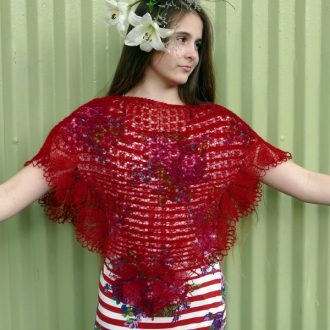 The shawl is knit from the top down to make it easy to customize the size. 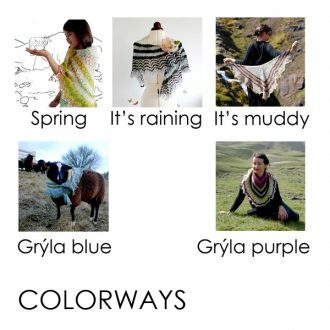 It can be knit in one color or more, and three were used for the sample shawl. “The wonderful book “Þríhyrnur og langsjöl” or “Three-Cornered and Long Shawls” by Sigríður Halldórsdóttir inspired me to start designing lace shawls in 1999. 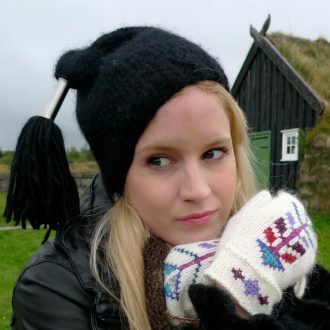 So when I was asked to teach a class on Icelandic lace shawls at the 2009 Nordic Knitting Conference in Seattle, I was happy to revisit that book, as well as explore the Nordic Heritage Museum’s extensive Icelandic lace collection. At the museum, I spotted a book about Icelandic settlers in the Pacific Northwest and remembered our Icelandic family friend, Bertha. My siblings and I are not clear about our relationship to Bertha, but we do know she is not a relative and that she grew up in Point Roberts, Washington. Most likely she was a friend of my grandmother since they were similar in age. She always was referred to as our great aunt and included in our family gatherings, as she did not seem to have other relatives nearby. Since she passed away in 1969, I had no hope of learning more about her.However, when I mentioned Bertha to two friends, one of them said they knew about her. Her husband’s deceased first wife was a great niece of Bertha’s through adoption. My friend has developed a relationship with the wife’s cousin Robbie, who also is Bertha’s great niece. 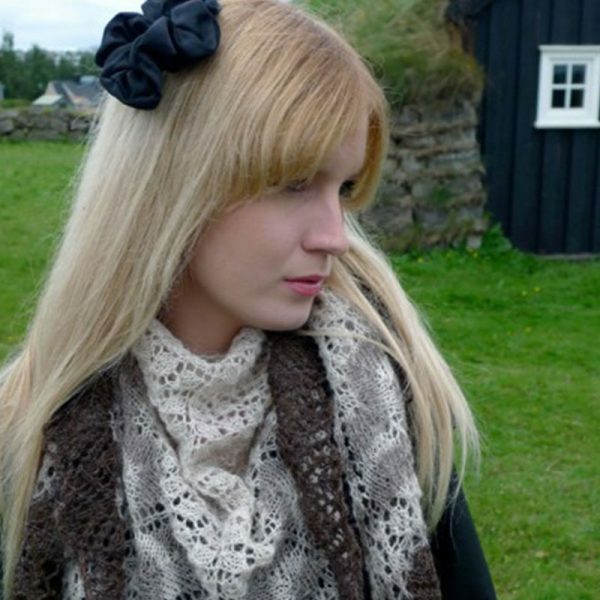 “My Icelandic modern lace shawl was inspired by the beautiful Icelandic lace on display in the Nordic Heritage Museum. 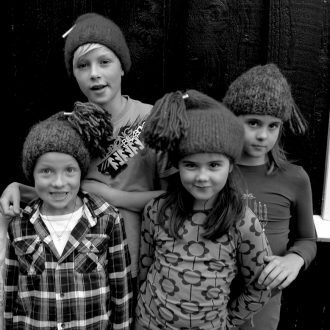 In the past, Icelanders combined two simple stockinette stitch lace patterns to create a variety of triangular shawls. Spider lace is a small, undulating pattern often used at the top. Trellis lace zigzags, so it is great for color changes and borders. 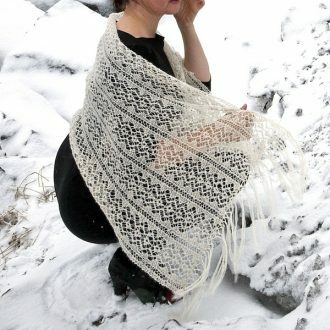 This shawl has been modernized so both the patterning and size can be customized. 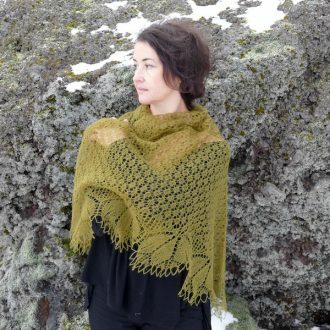 It has a narrow garter stitch border and interchangeable repeats of Spider and Trellis lace. Each increases 12 stitches over 4 rows, shaping the shawl to curve around the shoulders. It ends with a lacy edging that is bound off with crocheted chains. Needles and notions: US size 4 (3.5mm) needle; US size E (3.5mm) crochet hook; stitch markers; 1 coil less safety pin; sharp-pointed needle;180 rustproof pins for blocking. 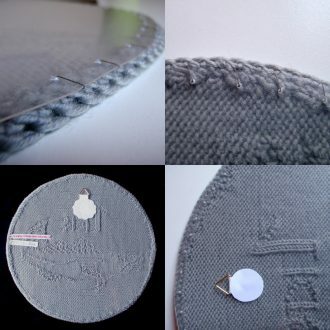 Optional: 1 yd (1m) smooth waste yarn and flexible blocking wires. 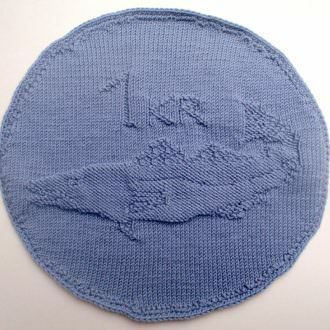 Techniques: knitted from the top down, lace, provisional cast on (optional). Errata: a mistake was found in this pattern, please check the errata. 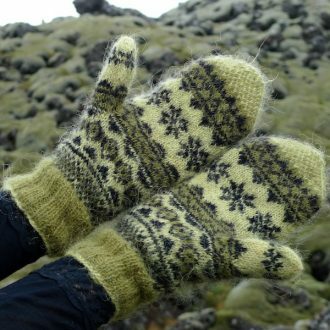 Please note that patterns purchased after 2011 are free of mistakes.